If you have been shopping around for air purifiers online, then you have no doubt stumbled across the GermGuardian AC4825 and you likely have lots of questions. Can it get rid of cigarette smoke? How many square feet can it clean? What is that blinking red light on the top? I will answer all these questions and more in this extensive GermGuardian AC4825 Air Purifier review. 2 How Does the GermGuardian AC4825 Work? 3 So Does All of This Amazing Technology Actually Work? 4 How Do You Use the GermGuardian AC4825? 5 What Is the Cost of Filters, Where Do I Get Them, and How Often Do They Need to Be Changed? 6 How noisy is it? Is the GermGuardian AC4825 Relatively Quiet? 7 What Is the Warrant? 8 What Are the Cons to Owning the GermGuardian AC4825? 9 How Does It Compare? 11 Where Can You Buy the GermGuardian AC4825 and How Much Does It Cost? The GermGuardian AC4825 is a three-step home air purifier made by a company called Guardian Technologies. Guardian Technologies is a pretty innovative company that makes air purifiers, sanitizers, humidifiers, and even essential oil diffusers. Essentially, they make small appliances that make the air in your house feel awesome. If you have done a bit of browsing, then you probably already know that the GermGuardian AC4825 is the top-selling air purifier on Amazon. With a 4.3 star rating and over six thousand reviews, it’s fair to say that the AC4825 is one of the best-tested air purifiers on the market. This is great for anyone who wants proven quality and durability. How Does the GermGuardian AC4825 Work? The GermGuardian AC4825 three-in-one air cleaning system is a 22-inch-tall air purifier that cleans dust and particles out of the air as well as kills viruses and bacteria using a three-step process. First, the air enters through the back, hitting the prefilter and activated charcoal layer. This first filter catches all of the large particles and pet hair and kills odors from animals or smoke. Second, the air goes through a HEPA filter that catches fine particles like pollen, pet dander, dust mites, and anything that might trigger your allergies. And third, a UV light kills airborne bacteria and germs that can cause allergies and disease. Sounds great, but is all that stuff just a gimmick? How is this different than the filter in my HVAC system? I mean, do charcoal and a fancy light bulb really do anything to purify the air? Yes, all of the technology in the GermGuardian AC4825 serves specific and important purposes. The first filter is important for two reasons: it filters the large particles while increasing the lifespan of the HEPA filter, and the activated charcoal stops odors. The first filter helps by catching the large particles and pet hair, which can then be cleaned off or the filter can be replaced much more easily than the more expensive HEPA filter. And if you don’t know anything about activated charcoal, well…. It’s basically magic. Activated charcoal is a special type of carbon that is pretty much the best filter ever. Your local water plant uses it to make dirty water drinkable, and some special shoe insoles use activated charcoal to prevent smelly feet. So it only makes sense to use it in an air purifier. The activated charcoal scrubs the air of any unwanted smells and really makes the air in your house crisp and fresh. The next filter layer is called the HEPA filter. HEPA stands for High-Efficiency Particulate Air. In order for a filter to be HEPA, it is required by law to filter 99.97% of particles that are .3 microns wide. .3 microns is incredibly small, and your standard HVAC home filter cannot come close to those numbers. HEPA filters keep the air clean that goes into your car’s engine. Doctors also use HEPA filters when handling tuberculosis patients and when dealing with other contagious viruses and bacteria. You could pretty much turn your home into a clean room using the GermGuardian AC4825. The only downside to the HEPA filter is that it can be expensive to replace. The final layer of air purification is the UV-C light. Ultraviolet-C light is sometimes called “ultraviolet germicidal irradiation.” The light kills things like bacteria, viruses, and germs. UV-C has been used for a long time for sterilizing medical instruments and purifying water. Recently though, companies like Guardian Technologies have adapted it to purify the air. Not only does the light kill germs, but it also activates titanium dioxide in the AC4825 which decomposes other harmful molecules. It is just incredibly genius and amounts to a machine made for total germ annihilation. So Does All of This Amazing Technology Actually Work? You will be amazed at how fresh and clean the GermGuardian AC4825 can make a room feel. And you will be amazed at the types of smells it can clear from a room. Some people even use the GermGuardian AC4825 for cigarette smoke. I don’t smoke myself, but some people have said it will clear the cigarette smell from a smoker’s house in less than a day. If it can do that, then it can do anything, and it does. It eliminates pet odors, pollen, and dust. If you live in a basement, the GermGuardian AC4825 will make the stale air crisp and refreshing. This is a perfect air purifier for people with allergies who will find that they can finally breathe in their own homes. How Do You Use the GermGuardian AC4825? The GermGuardian AC4825 is very easy to use and understand. It comes in the mail completely assembled and ready to go with the filters already in place. Just plug it, turn it on, and choose your power setting. Most people put the AC4825 away from the wall so that it can get good circulation throughout the room, and some even put it in the middle of the room. The manual says that the GermGuardian ac4825 can be used in a room up to 155 square feet, or about a 12-foot by 13-foot room size. But don’t be afraid to use it for a larger space. Most people have found that it works great even in much larger spaces! I would recommend having one for every 600 square feet of the house. Check out the video below to see the AC4825 in action! What Is the Cost of Filters, Where Do I Get Them, and How Often Do They Need to Be Changed? When you see a blinking red light on the top of the AC4825, then it is time to change the filter. You can expect to change the filter about every 6 to 8 months. Changing the filter is very easy and doesn’t require any tools. Just take the back off by pushing on the clip near the top and pull. The plastic back will come off and reveal the filters. Both filters can be removed at the same time. After you remove the filters, you can see the special UV bulbs near the top. The bulbs should last a long time. It’s kind of important that you use the Guardian Technologies replacement filters for the AC4825 since the HEPA filter is the most important part of the whole device. Replacing the HEPA filter with a cheap off-brand filter would be like replacing a flat tire on your car with a bicycle wheel. New filters are normally listed at $34.99; however, you can usually find them cheaper on Amazon. It’s best to have one or two extra filters handy so that you can easily swap them out when your red light starts blinking. You can also make your filters last longer by cleaning them. You cannot wash them in the sink like you can with a cheaper filter, but you can vacuum the HEPA filter. I recommend using a vacuum on the carbon filter and the HEPA filter every month. You can also replace the carbon filter cheaply on a more regular basis. How noisy is it? Is the GermGuardian AC4825 Relatively Quiet? Yes. The GermGuardian AC4825 is not a fan, so it is not as loud as a fan. It isn’t designed to move air fast to circulate through the room like a fan does. The AC4825 just quietly does its thing without disturbing you. The only time you may notice the noise is if you are trying to sleep with it in your bedroom on its highest setting. In that case, simply turn it on low and you probably won’t notice it. The GermGuardian AC4825 has a three-year limited warranty. The warranty, of course, does not apply to the filters or the UV-C bulbs, which are designed to be replaced. What Are the Cons to Owning the GermGuardian AC4825? One of the major downsides to the GermGuardian AC4825 is that there is a little window at the top that lets the UV light shine through. This blue light is really distracting in a dark room. It is not ideal for trying to watch a movie or sleep. And yes, this light is safe to look at, it’s just a poorly thought-out design feature. The easiest way to stop the blue light is to turn off the UV by pushing the button on the top, but then you don’t get the benefits of the UV light sterilizing your air! Some people put dark tape over the light window, which does a great job of blocking the light. I would recommend using electrical tape or black duct tape. Some people worry about the UV-C lights in the GermGuardian AC4825 emitting ozone. Fortunately, this is not an issue. The UV lights emit light at a lower frequency than what is possible to emit ozone. The GermGuardian AC4825 is an ozone-free machine! Some people who have bought the GermGuardian AC4825 say they have the blinking red light right out of the box. Do not worry, nothing is wrong with your machine. All you have to do is reset the light by holding down the button for 3-5 seconds. Once the indicator is reset, then it is good to go! Another common complaint that some people have is that their GermGuardian AC4825 has an air outlet issue. They say that air only comes out of one side of the machine. There is nothing wrong with the machine, that’s just how it works! The way the fan inside is designed means that it only blows air out of one side. The only difference between the GermGuardian AC4825 and the AC5000 is size and price. The AC5000 is 28 inches tall compared to the 22-inch-tall AC4825. The manual states that the AC5000 can be used in rooms up to 193 square feet, or about 14 by 14 feet. Of course, just like the AC4825, most people use it in even larger spaces. I would recommend one AC5000 for every 900 square feet of floor space. The difference here is a bit of quality and the size. The AC5350 is the same size as the AC5000 at 28 inches tall and it can handle about 1000 square feet of floor space. One advantage of the AC5350 over the AC4825 is that it has a nice digital display that gives you more control. The AC5350 has five power settings, while the AC4825 only has three. And I know that beauty is in the eye of the beholder, but the AC5350 is just a better-looking model. Of course, you pay a lot more for those extra features. There is a big difference between the GermGuardian AC4825 and the AC4100. The AC4100 is very small, at only 11 inches. It’s half the height of the AC4825. The smaller AC4100 is made for sitting on a desk or table and is built for small rooms. The AC4100 should only be used for spaces of about 100 square feet. The GermGuardian AC5250PT is very closely related to the AC5350. It is 28 inches tall, compared to the AC4825 at 22 inches, which means it can clean a larger space. It also has a digital screen and more settings, like five power levels. The AC5250PT is also able to clean a room a bit faster than the AC4825. The only difference between these two units seems to be the design. The AC4900CA is a bit more minimalist and geometric compared to the AC4825. There are a number of differences between these two models. First, you will notice that they look a lot different. The Winix is wide and flat, while the GermGuardian is skinny and tall. The Winix also has some extra features over the GermGuardian, like a timer and an extra power setting. One major difference is that the Winix comes with a remote so that you can control the power setting from anywhere in the house. These differences come at a price, though. You could almost buy two GermGuardians for the price of the Winix 5500. The Purezone and the GermGuardian AC4825 have a number of differences. The Purezone is a desktop or tabletop model designed for small rooms. Despite being much smaller, the Purezone is quite a bit more expensive than the AC4825. There are large differences between the Honeywell and the GermGuardian. The major difference is that the Honeywell does not have a HEPA filter. The GermGuardian’s HEPA filter traps 99.97% of particles, while the Honeywell does not. The upside to the Honeywell is that its filter is permanent and washable. The major difference between the GermGuardian and the Honeywell is that the Honeywell does not use UV light to kill bacteria and mold like the GermGuardian does. The Honeywell 50250-S does use a HEPA filter like the GermGuardian and does a good job of filtering particles, but it doesn’t have the germ-killing power of the AC4825. The Coway AP-1512HH uses a HEPA filter just like the GermGuardian but does not have UV light for killing bacteria and mold. This is a major advantage for the GermGuardian and for people who have allergies or are prone to airborne illness. One major difference between these two models is that the Coway is significantly more expensive than the GermGuardian. You could buy almost three AC4825s for the price of a Coway. The GermGuardian AC4825 is an AMAZING product! The AC4825 is able to clean and sanitize the air in ways that its competitors can’t and for a price that competitors can’t beat. After you’ve installed the GermGuardian AC4825, the air in your home will be fresh and crisp and clean in less than a day. This thing is perfect for smoking houses, people with pets, people with allergies, or just anyone who wants to have a better life in their own home. I highly recommend the GermGuardian AC4825 three-in-one air cleaning system if you are looking for an air purifier for your home. 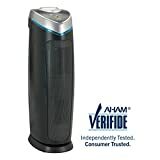 Where Can You Buy the GermGuardian AC4825 and How Much Does It Cost? The GermGuardian AC4825 is sold in most stores you would expect. You can find it at Walmart, Target, Lowes, Best Buy, and Amazon. It lists for $99.99, but you can usually find it cheaper on Amazon, where the price can fluctuate. To buy the GermGuardian AC4825 on Amazon, click below.